Upgrade your cabin or rustic home with the Colton collection by C&F Enterprises. Stately deer in reds and browns adorn the ensemble placed against a cream colored background. The warm colors of this collection will bring a "homey" feel to any room. With coordinating valances and throw pillows, you can take the Colton pattern to any room of your house! The dark brown European shams and bedskirt complete the look. This collection is 100% cotton and machine washable for easy cleaning! Made by C&F Enterprises. 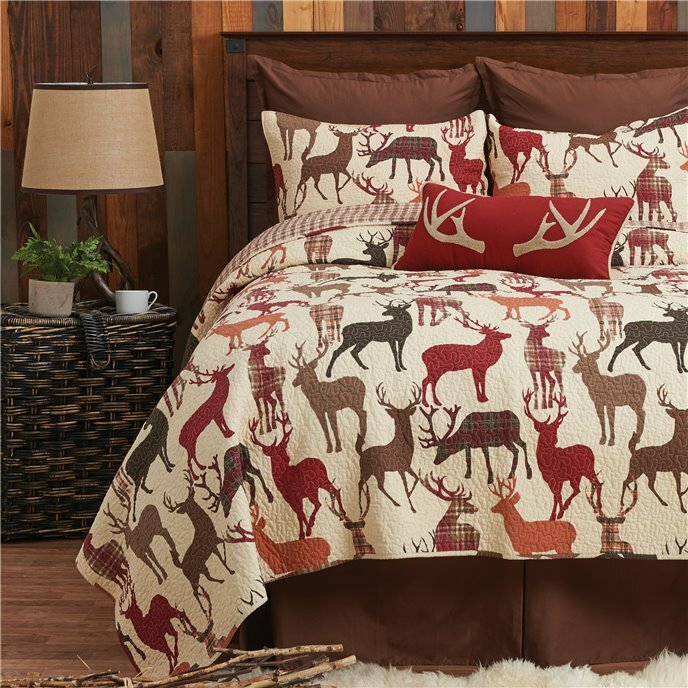 Decorate your cabin in the woods or anyplace "deer" to your heart with the Colton Quilt Set. In a rustic colorway of red, beige, brown, and green, an allover deer print makes a statement on a cream colored ground. Reverse to a beige plaid pattern for additional styling options. Crafted of cotton, this bedding set includes a quilt and coordinating standard sham(s). 1 Twin Quilt and 1 Standard Sham, Measurements: Quilt 64" x 86"; Sham 20" x 26" , Hand Guided Vermicelli Stitching, Coordinating Accent Pillows, Euro Shams and Bed Skirt Available Separately, Face 100% Cotton, Fill Material Polyester/Cotton Blend, Machine Wash Cold, Line Dry, Imported. Made by C&F Enterprises. Decorate your cabin in the woods or anyplace "deer" to your heart with the Colton Quilt Set. In a rustic colorway of red, beige, brown, and green, an allover deer print makes a statement on a cream colored ground. Reverse to a beige plaid pattern for additional styling options. Crafted of cotton, this bedding set includes a quilt and coordinating standard sham(s). 1 F/Q Quilt and 2 Standard Shams, Measurements: Quilt 90" x 92"; Sham 20" x 26" , Hand Guided Vermicelli Stitching, Coordinating Accent Pillows, Euro Shams and Bed Skirt Available Separately, Face 100% Cotton, Fill Material Polyester/Cotton Blend, Machine Wash Cold, Line Dry, Imported. Made by C&F Enterprises. Decorate your cabin in the woods or anyplace "deer" to your heart with the Colton Quilt Set. In a rustic colorway of red, beige, brown, and green, an allover deer print makes a statement on a cream colored ground. Reverse to a beige plaid pattern for additional styling options. Crafted of cotton, this bedding set includes a quilt and coordinating standard sham(s). 1 King Quilt and 2 King Shams, Measurements: Quilt 108" x 92"; Sham 20" x 36", Hand Guided Vermicelli Stitching, Coordinating Accent Pillows, Euro Shams and Bed Skirt Available Separately, Face 100% Cotton, Fill Material Polyester/Cotton Blend, Machine Wash Cold, Line Dry, Imported. Made by C&F Enterprises. Flanged euro sham in brown. Euro pillow insert not included. Product: 1 euro sham. Product Measurements: 26 x 26. Material: Cotton. Care instructions: machine wash. Maker: imported, made by C & F Enterprises. Basic brown box pleated bedskirt that has split corners. Secured by a decking platform that goes under your mattress. Product: 1 bedskirt. Product Measurements: 39 x 76 + 18 inch drop. Material: Cotton/Platform Poly. Care instructions: machine wash. Maker: imported, made by C & F Enterprises. Basic brown box pleated bedskirt that has split corners. Secured by a decking platform that goes under your mattress. Product: 1 bedskirt. Product Measurements: 60 x 80 + 18 inch drop. Material: Cotton/Platform Poly. Care instructions: machine wash. Maker: imported, made by C & F Enterprises. Basic brown box pleated bedskirt that has split corners. Secured by a decking platform that goes under your mattress. Product: 1 bedskirt. Product Measurements: 78 x 80 + 18 inch drop. Material: Cotton/Platform Poly. Care instructions: machine wash. Maker: imported, made by C & F Enterprises. Complete the look of your lodge décor with the Tufted Antler Pillow. Featuring a tufted antler motif atop a red ground, this pillow features a rope edge along with a removable insert and zipper closure for convenient care. Measures 12" x 24", Contrasting Rope Edge Finish, Filled and Finished in USA, 100% Cotton Cover, Fill Material Polyester, Spot Clean, Imported. Made by C&F Enterprises. Set the scene in your favorite lodge-themed space or cabin with the Bear Hooked Pillow. This pillow includes a zipper closure and removable insert for easy care. Woodsy brown background with the silhouette of a bear in tan. Measures 18" x 18", Clean Knife Edge Finish, Filled and Finished in USA, Acrylic Yarn on Cotton Canvas, Fill Material Polyester, Spot Clean, Imported. Made by C&F Enterprises. Set the scene in your favorite lodge-themed space or cabin with the Buck Hooked Pillow. With a unique hooked texture and rustic colorway, this pillow includes a zipper closure and removable insert for easy care. Measures 18" x 18", Clean Knife Edge Finish, Filled and Finished in USA, Acrylic Yarn on Cotton Canvas, Fill Material Polyester, Spot Clean, Imported. Made by C&F Enterprises. The Colton valance features deer silhouettes in solids and plaids on a neutral beige background in rich colors include crimson red, taupe, dark olive, and muted burnt orange. Straight rod pocket valance. 15.5"H x 72"W. Unlined. We offer the complete ensemble in the Colton pattern by C & F.